Where the Web was born..
Today I visited the CERN, the research center in Geneva, Switzerland, where Tim Berners-Lee worked when he developed the “World Wide Web” back in 1990. This sign is right next to his former office door in a dark corridor of the oldest building of CERN. 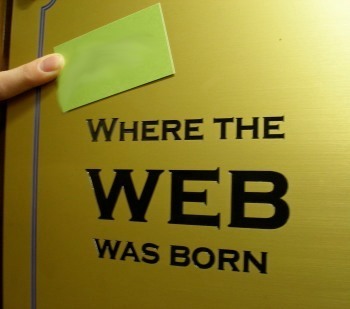 I attended a talk on the history of the web given by Robert Cailliau, who was the main collaborator of Tim Berners-Lee. The most interesting part of his presentation was on “le grande erreur”. They had to significantly reduce the features of their first web browser and server in order to run on almost any computer. Their original attempt included also the editing of the pages, but the reduced version was very basic, with no pictures and only static pages containing text with numbered links. When things took off, they thought that not implementing all their many ideas due to the lacking support on most computers would be a big error. However, due to this very simple version they made the web as we know it today possible. After all, starting with such a very basic and rather limited version, enabled the flexibility of the standards that were the result of Tim Berners-Lee’s work. It has not always to be the amount of features that a software supports, but sometimes, if very few things fit incredibly well together the overall result more valuable. In our discussions on future features for Prototype Creator we follow the approach that with few but well implemented concepts a better result can be achieved. p.s. : and yes, at CERN they might create some black holes with their new accelerator. However, everybody assured that they won’t be dangerous.